Figure 1. 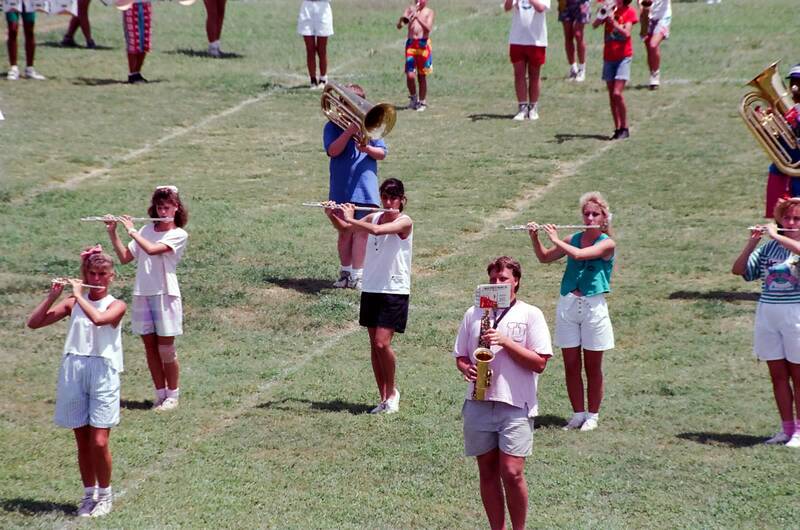 Playing the flute at CHS marching band camp, 1988. Please, spare me the “One day, in band camp” quote. Let’s face it: our jobs are not exactly physically demanding. In terms of incidental exercise and predicted health outcomes, I think we are right up there with bus drivers. My day-to-day sedentary activities include exciting, in-front-of the computer data analysis, writing, and reviewing as well as thrilling and heart-pounding seated conference calls and in-person meetings and scientific conferences. Oh, there is some standing while lecturing for a few hours on end. All of this coupled with eating on the road, faculty dinners, and departmental happy hours make staying in shape very difficult. What’s a person to do? 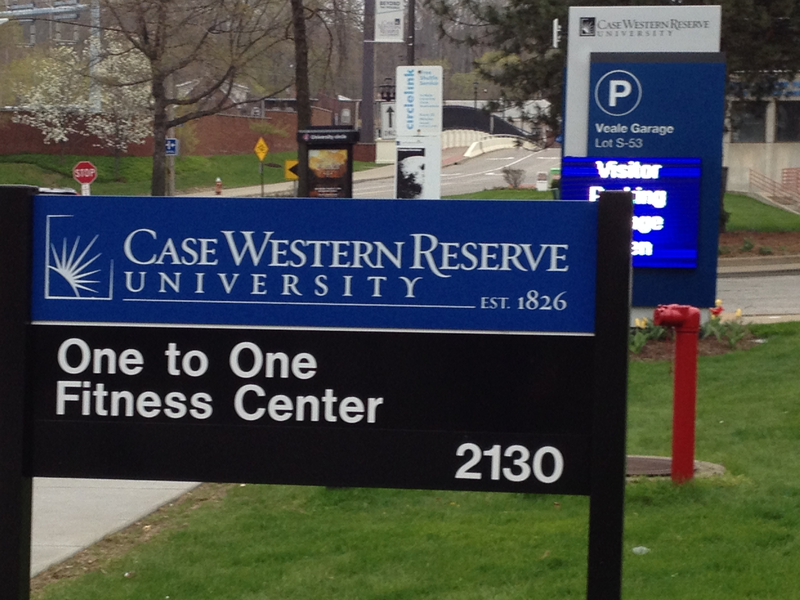 Well, at CWRU, one option of action is One to One Fitness, located five minutes away from our office by foot (Figure 2). Membership gains you access to the well-equipped gym as well as structured classes. I love classes. I am, after all, an academic. My favorite classes right now are cardiomuscle and muscle conditioning. I don’t do yoga. Period. I have tried spin class, but I have to admit that I don’t think I really get it. I mean, what’s at the top of this hill we are always climbing? What are we cycling in the dark? And, does it matter if I am on a leisure bike while everyone else seems to be racing in the Tour de France? Figure 2. One to One Fitness is clearly marked on campus and close by, so there are no excuses! In addition to the structured classes, I have added to my membership a weekly 30 minute session with a personal trainer (Lauren Scacchi: a strong woman making this woman stronger!). Slowly but surely I am working towards my Michelle Obama arms. If only I could dance like her…. I am not the only one in the family to enjoy all that One to One has to offer. Mom is now going to the morning senior class as part of Silver Sneakers. They are currently doing weights to classical music. Mom is putting together a Latin-inspired playlist to shake things up. Watch out Ohio seniors---Mom’s in the house and wants to dance! After the workout, there’s the option of stopping at the Recovery Zone to buy a tasty but somehow healthy smoothie. In fact, if you are in the mood for a smoothie and on campus, I am sure you can stop by to grab one. I have not yet ordered a smoothie, but the guy behind the counter seems nice, and occasionally there are some yummy samples to taste (Figure 3). One to One Fitness: good for the body and smoothies for the soul! Figure 3. 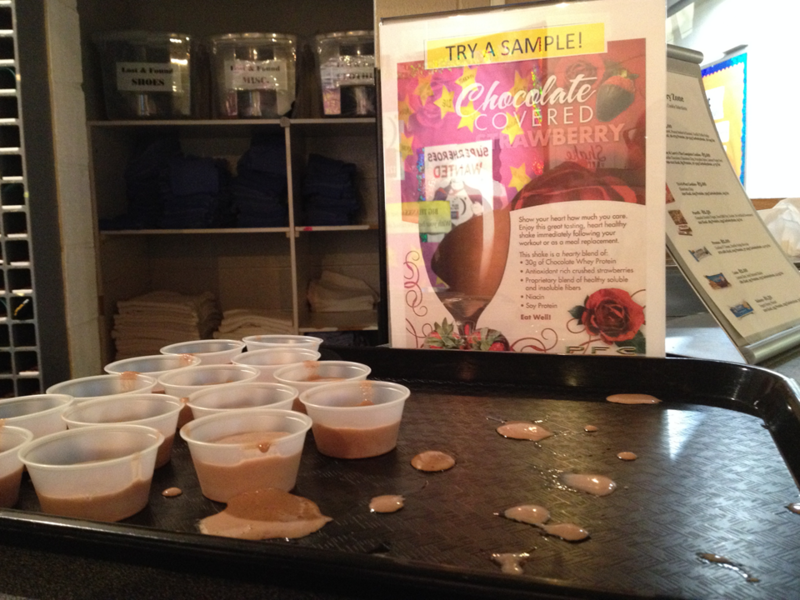 The Recovery Zone, offering samples of smoothie of the month. Associate Professor of Population and Quantitative Health Sciences and Assistant Director of the Cleveland Institute for Computational Biology, with interest in pharmacogenomics, electronic health records, and diverse populations. Also, an avid foodie!